Chelsea boots are massively in fashion at the moment! You will have seen them in a variety of different stores in either black or brown (the most popular colours). I've found the perfect pair from Topshop! After a quick Google I have discovered that the boot originated in the Victorian era, beginnning as a type of riding boot. They were then adopted by mods in the 1960s and have now become popular once again. This pair from Topshop is on sale for £45 - HERE. I tried these on the other day but was indecisive about buying them. I really want them now - typical! Hopefully I will be able to find them again, although they are also available online. What do you think about the Chelsea boot - yay or nay? How gorgeous are these ! 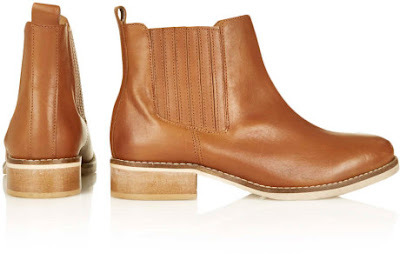 I love the side panels in them, all the other chelsea boots I've seen have had plain elastic panelling.